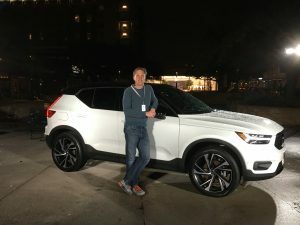 I’m in Austin for the North American media drive of the all-new Volvo XC40 – now the smallest member of their SUV family, completing a trifecta of formidable crossovers the Swedish brand is banking on to further their prosperous rebirth. It was 3 years ago that the redesigned XC90 truly launched a new era at Volvo Cars; a 3-row SUV that instituted all that was new; the culmination of an ownership change from Ford to Geely that took place in 2010. The midsized XC60 was next up for its redesign and recently garnered North American Utility Vehicle of the Year honors. And now we’ve come to the first-ever XC40. Playing in the up and coming premium small SUV segment with the likes of the BMW X1 and Lexus NX, the XC40 is priced from $36,195 including destination. Built in Belgium, you can pre-order one now for arrival this spring. And having driven it through cityscape and Texas farm country, there’s no doubt in my mind that this will be a resounding sales success. Without captivating design manufacturers’ face an uphill battle – particularly in this segment – and Volvo’s strongest bid at urban-inspired, Scandinavian chic appears to be spot on. With one parked in the lobby, hotel guests were continuously seen pining for one of their own. From the imaginative color palette to the contrast roof, I absolutely love the style it exudes. It says premium, fun and rugged all in one sentence and that’s not easy to do. Even though Volvo has conceived it as a city vehicle, its standard all-wheel drive, impressive 8.3” of ground clearance, hill decent control and off-road driving mode also afford a heightened sense of confidence when conditions get tricky. Powering the XC40 is Volvo’s ubiquitous 2.0-liter turbo-4 and 8-speed automatic powertrain driving all 4 wheels, good for a spirited 0-to-60mph sprint of 6.2 seconds. A front-drive model designated as T4 will follow later as will hybridized and pure electric versions. The new Compact Modular Architecture upon which all 40 Series Volvos will be built feels light yet rigid integrating a chassis delivering both comfort and agility. I spent most of my time driving this top-level R-Design trim. Priced from $38,695 including destination, it adds a number of unique bits to spice up the appearance as well as an uprated sport chassis and paddle shifters. Easily maneuverable with an optional 360 degree camera and available semi-autonomous driving and park assist, the XC40 just feels rightly sized and easy to drive. Well, there is one hurdle to that easy part and that’s the shifter which can be maddening to get into reverse and drive – something Volvo should change immediately. Volvo says they’ve conducted extensive global research into how these types of vehicles are used and discovered that proper storage is essential….just ask my wife. As such there are larger door pockets, integrated bag hooks and a customizable cargo area. The unusual placement of the stereo system’s air-ventilated woofer behind the dashboard removes the necessity for speakers in the front doors introducing more stuff-it space. And then there are bag hooks, a storage box under the driver’s seat, a waste bin with net in front of the armrest, hands-free tailgate, and a foldable, removable load floor – the little things that make life easier and don’t we all want more of those. Wireless phone charging for capable devices and a special space for phones make connecting with the rectangular touchscreen simpler. With the seats up – and they can be lowered at the push of a button – there’s more cargo room than in the Lexus NX but not nearly as much as in the BMW X1. The cabin is gorgeous – very high-end looking with the aluminum cutting edge inlays and suede-like inserts for the leather seats – heated and with a heated steering wheel. Those both came in handy on my 1-day journey in and around Austin where the temps were in the 30s at times with an unrelenting rain. Rear seat spaciousness is also on the mark. And here’s a cool perk: Volvo On Call connectivity features are free for 4 years and the XC40 gives you the ability to share the car with others via a mobile phone app. Because every Volvo is beginning to feel the same from the cabin, my issues with the XC40 are by in large no different than those I’ve experienced in the 90 series cars; the infotainment is cool looking but a bit cumbersome to use and can be slow to boot up, there’s that annoying double clutch shift lever and Pilot Assist – where you can take your hands off the wheel and let the XC40 drive for you for short periods of time – fails just enough to make me wary of using it. Otherwise, this is a thoughtfully conceived crossover I can easily envision as Volvo’s best seller.